An Indigenous knowledge network. 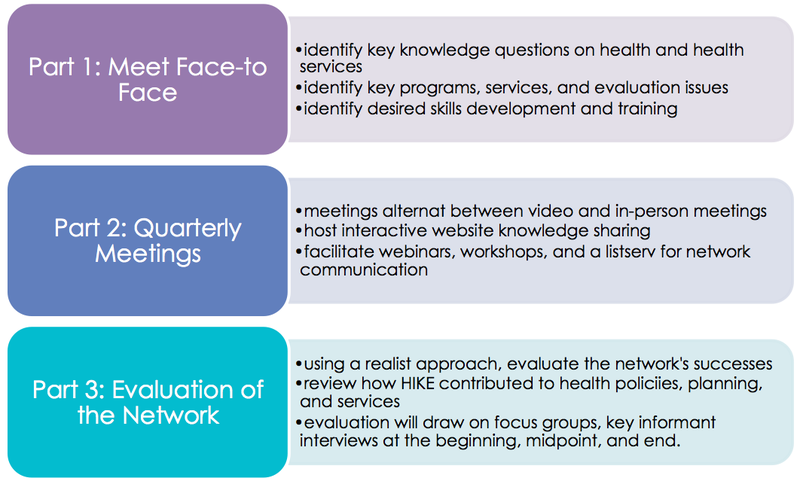 Its aim is to optimize the knowledge sharing, relevance, and application from the Our Health Counts project. Knowledge network = group of experts that a) collaborate on common concerns, b) strengthen collective knowledge bases, and c) develop solutions to concerns. Front line staff from the Aboriginal health service partners (in each of the Our Health Counts urban communities), an academic research team, select group of key urban Aboriginal health policy makers (from urban Aboriginal health services), local public health representatives, Local Health Information Networks (LHINs), and representation from the Ministry of Health and Long Term Care. HIKE members are being seconded for 15 days/year to participate in HIKE activities.